Tonight was about color AND graphics and we just wanted to have fun with a playful yet bold statement look. With only 25 minutes for hair and makeup it was about getting it done quick! I used a liquid liner to paint on a giant cat eye with no blended edges (which can take time). I used a lower lash on the lower outer corner & whirl lip liner with a mix of light beige lipsticks for her soft mouth. For tonight's get the look, Christina wanted to wear graphically striking prints. She felt it would really pop off the red chair. She wore Alphabet crop top by lazy oaf, over a black Silk camisole by The Row, Love Beatrice Polka Dot Tights and Christian Louboutin Suede pink platforms. all Jewelry from Roseark, West Hollywood. 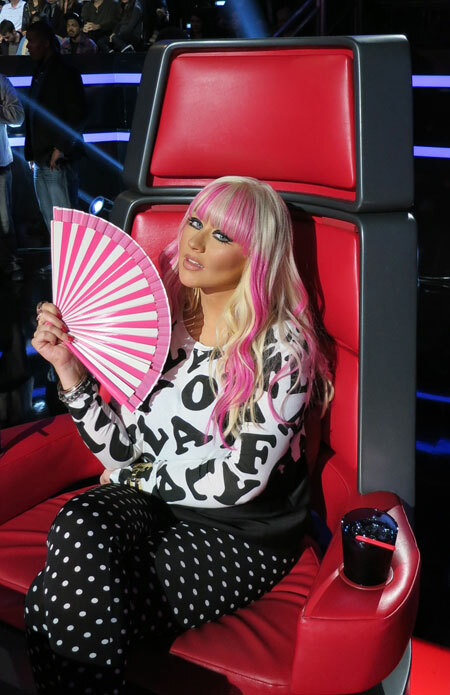 Tonight on The Voice, Christina's hair was inspired by Japanese Pop art. I gave her a pop of color by adding flamingo pink streaks to her bangs and ends of her hair. I used Brazilian blowout texturizing cream to add shine and texture. Then I added a little wave with a 1 inch iron.